What did you accomplish by the age of 16? 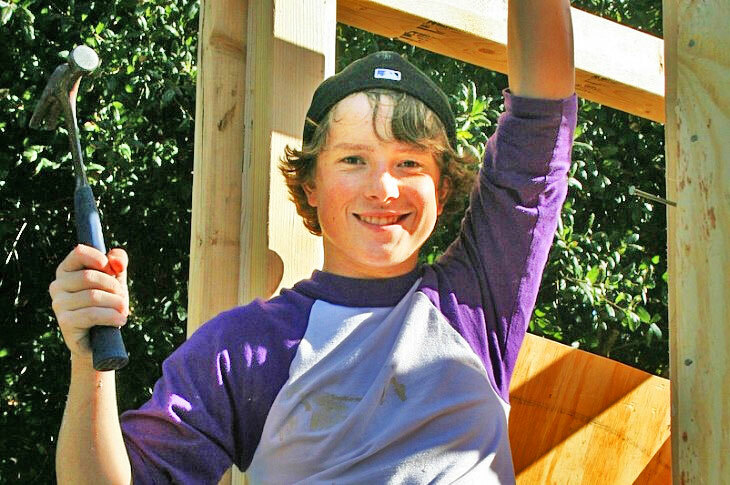 That's how old high school junior Austin Hay is, and he's already built an entire house! Well to be more precise, the tiny home will be officially done by November, but still - that's pretty impressive. What originally started as a school project has turned into a full-blown year-long construction job to build a 130 sq ft house based on plans from Tumbleweed Houses that make use of recycled, donated, salvaged materials. We caught up with Austin in between school and homework to ask him a few questions about his tiny house. 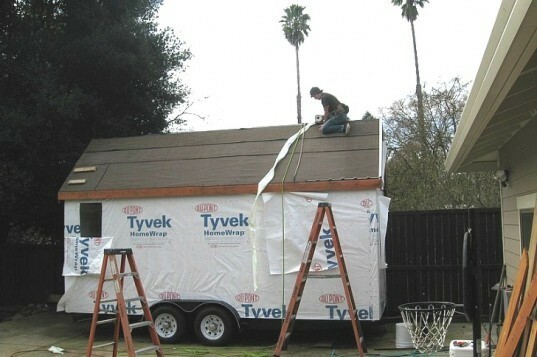 Austin always thought it would be cool to build a treehouse, but once he found out you could build homes on a trailer to make them mobile, he quickly changed his mind. Basing his house on the popular Fencl Tumbleweed House model, Austin began construction in July of 2010. He bought a trailer for $2,000 at a used car dealership in Oregon just a few hours from his home in Sonoma County, California. Over the past year, Austin has slowly built up the tiny home with help from his father and friends. He’s gotten materials out of scrap yards and recycling centers as well as donations from family and friends. All of the doors and windows are salvaged and the wiring was scrap from an electrician friend. 30 sq ft doesn’t sound like much to most of us, but Austin has it all planned out and thinks the lofted ceilings are the key to making the home feel more spacious. A sleeping loft sits above the kitchen and bathroom area, which includes a shower, a composting toilet, a fridge, a sink and even a stove and an oven. Austin even has it planned out so there will be desk where he can do his homework and a futon in case he has friends stay over. He’s still got two years of high school left and hopes to move in officially once it’s complete in November. After high school, the plan is to take the tiny home on the road and set it up wherever he can. Click through to see what else Austin had to tell us about his tiny home. Inhabitat: What made you decide to build a tiny house in the first place? Austin Hay: Well, I always liked building, but I found Tumbleweed Houses, fell in love and decided lets do it. Inhabitat: Did you know very much about building and construction before you started? Austin Hay: My parents’ house burnt down 5 years ago and my dad took over as main contractor to save money, so I learned as he went along and picked it up fast. Inhabitat: What amenities do you have inside? Austin Hay:I have the same amenities as a any house would have, just more condensed. Inhabitat: What is it built out of? And how much of it is built from found or recycled materials? Austin Hay: The house is made out of mostly wood and a metal trailer. I used a lot of recycled material like the flooring, sink and front door found at a resale store. Inhabitat: How much do you estimate it to have cost so far? Austin Hay: I have spent about $7,000 so far and it will cost around $12,000. Most people would have to pay between $20,000-$25,000. Inhabitat: When did you start building it? And how far are you away from being done? Austin Hay: I bought my trailer in July of last year and I want to be done before November. Inhabitat: Any ideas as to where you’ll go to college? Austin Hay: Either of the Oregon schools or Cal Poly. Inhabitat: What would you like to study? Architecture by any chance? Austin Hay: I love math- it’s my strong subject – but I must say I love to learn how things work and architecture is going to be part of my studies in college. Inhabitat: What’s your favorite part of the house? Austin Hay: My favorite part of my house is that it is mine and has my blood, sweat and hard work put into it. Inhabitat: And knowing what you know now, what would you do differently? Austin Hay: I would have started soon and got more stuff ready but not much else. I learned a lot on the way. See more of the house and learn more about Austin’s fantastic philosophy to building tiny houses in the video below by FairCompanies.com. As he tells the interviewer, “I have heard of the tiny house movement and a lot of people say I’m part of it. And I’m glad to be part of it and show that it’s easy to build one of these and anyone can do it.” Wise words from a 16 year old. 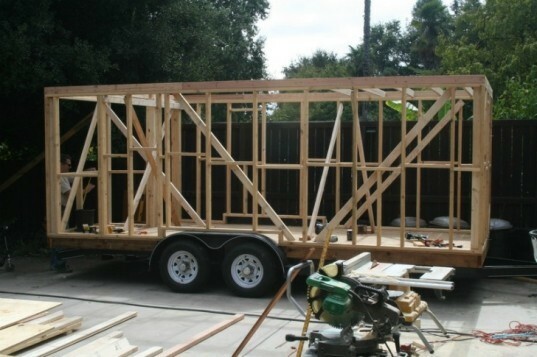 Austin always thought it would be cool to build a treehouse, but once he found out you could build homes on a trailer to make them mobile, he quickly changed his mind. Basing his house on the popular Fencl Tumbleweed House model, Austin began work on building his tiny house in July of 2010. He bought the trailer for $2,000 at a used car dealership in Oregon and just a few hours drive from his home in Sonoma County, California. Over the past year, Austin has slowly built up the tiny home along with help from his father and friends. Austin even has it planned out so there will be desk where he can do his homework and a futon in case he has friends stay over. Austin carefully installs the roofing material. After high school, the plan is to take the tiny home on the road and set it up wherever he can. Austin sitting in his first home that he will own outright with no mortgage. He's gotten materials out of scrap yards and recycling centers as well as donations from family and friends. All of the doors and windows are salvaged and the wiring was scrap from an electrician friend. A 130 sq ft doesn't sound like much to most of us, but Austin has it all planned out and thinks the lofted ceilings are key to the design and make it feel bigger. A sleeping loft sits above the kitchen and bathroom area, which includes a shower, composting toilet, fridge, sink and even a stove and an oven. He's still got two years of high school left and hopes to move in officially once it's complete in November. Austin tests out his sleeping loft for a quick nap.